Philos Global Technologies, a leader in the world of surface technology and the approved provider of PST surface treatment technology in the US, is proud to announce that with the beginning of a new year in 2016, it has moved into a new headquarters building in the City of Buffalo Grove, just 20 miles northwest of downtown Chicago. From the new headquarters, we will be running new state-of-the-art PST treatment facilities to better serve all our customers around the nation, and to develop new surface treatment technologies. Please come and visit us when you are in the Illinois area. Philos Global Technologies opened its booth at the 2015 Die Casting Congress & Exposition hosted by the North American Die Casting Association in the beautiful city of Indianapolis from October 5 to 8, 2015. 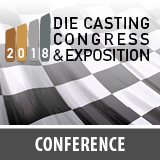 We were gratified by the warm reception to our new PST treatment technologies by the show attendees, and also to meet and greet all our great customers and friends in the die casting industry. We cannot wait to see you again in 2016.